Many years ago, at an ACF Conference in Phoenix, Andre Soltner (in my mind one of the greatest chefs in recent history) spoke to an audience of enthusiastic members. He began by trying to downplay the hype that was building around the term “chef” by removing his glasses and looking at the audience directly and very seriously. I will always remember his significant words: “Ladies and gentlemen, we must never lose sight of the fact that we are all cooks.” His point was well taken by most who were present – let’s put aside the rumblings of prestige, slightly ill-founded celebrity status, and self-importance and remember that our jobs, and the enjoyment of our craft, evolves around cooking for others. We all know how hard this work can be – many in and out of the industry including myself have portrayed this fact. The importance of what we do lay in the fulfillment that comes from creating beautiful, delicious food for others to enjoy. This is the whole enchilada, our reason for walking through those kitchen doors and investing considerable time and effort every day at our work. We are cooks, those individuals who have invested the time to nurture the skills necessary to convert raw materials into food worthy of praise. 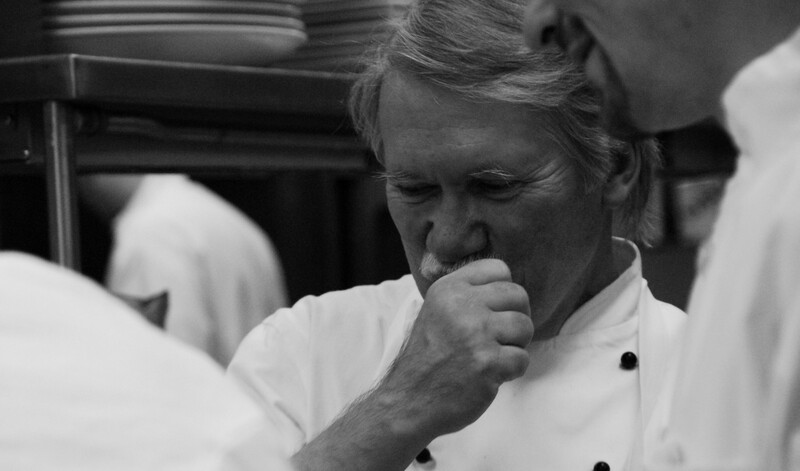 I think that we can all appreciate that all of the interest in and praise of chefs has helped our careers in significant ways, but when all is said and done, if we do not enter the kitchen every day with a strong desire to cook well, respect the ingredients that we are privilege to handle, and make delicious food, then the praise and interest mean very little. After all, if we don’t love the process of cooking then there are certainly many other, less consuming career paths to seek. If we don’t relish the opportunity to work with other serious cooks who do what they do for the feeling of accomplishment that comes from executing established cooking methods, building flavors to match those imbedded flavor memories that come from experience, and placing those creations on plates like an artist paints a canvas, then we are on a treadmill that will wear any person down at some point. Cooks are able to convert the simplest of ingredients into a dish that turns heads and brings a smile to the face of even the most critical of people. Good cooking allows an individual to appeal to every human sense. No other art form can do this. At the end of the day, a professional cook like a carpenter, construction worker, electrician, fisherman, or plumber is physically exhausted, but gratified at having worked hard and able to show tangible accomplishment. Cooking is part of the ecosystem of life that pays respect to farming, rewards those who consume the product for the work that they do, and eventually replenish the soil to start the cycle all over again. Cooking and the resulting finished food is the catalyst for bringing people together and creating a forum for conversation, recognizing each person’s similarities and differences, and allowing everyone to find common ground. Everyone can find commonality in tasting exceptional food. We are all cooks – first and foremost. Cook for the love of cooking – this is what makes the work worthwhile. STILL TIME TO PICK UP THAT LAST MINUTE HOLIDAY GIFT FOR A COOK, CHEF, RESTAURATEUR, CULINARY STUDENT OR FOOD LOVER – Order your copy of “The Event That Changed Everything”, a novel by Chef Paul Sorgule, author of Harvest America Cues. Great Read love getting emails and newsletters It helps with training and growing thanks again.